The twenty-second tropical weather system (and eleventh typhoon) of the year in the Western Pacific Ocean had the potential to be one of the most damaging of 2014. In early December, Hagupit approached The Philippines as a major and slow-moving typhoon that threatened to hit the islands with torrential rain and a large storm surge. Hundreds of thousands of people were evacuated in the lead-up to the storm on December 5. 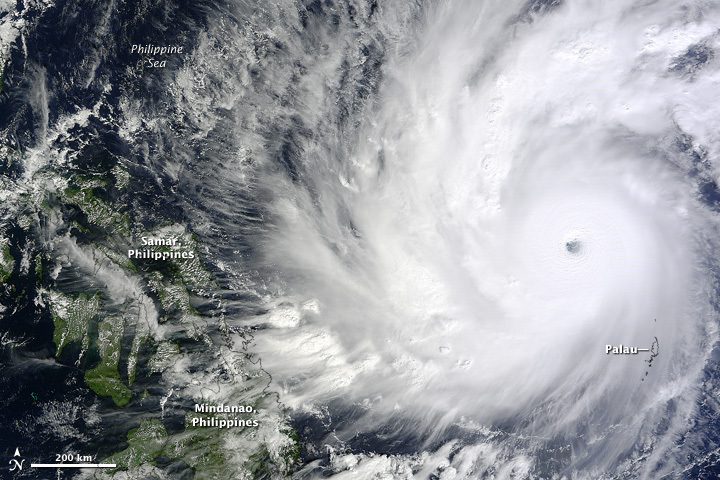 The Moderate Resolution Imaging Spectroradiometer (MODIS) on NASA’s Terra satellite acquired this image at 11:20 a.m. Palau time (0210 Universal Time) on December 4, 2014. At the time, Hagupit was a category 5 super typhoon with sustained winds of 155 knots (180 miles or 290 kilometers per hour). It was the fourth category 5 typhoon of the year in the Western Pacific.